Valentine’s Day, a holiday celebrating love or just a commercial holiday. How do you feel about it? Once upon a time I was the hopeless romantic and loved Valentine’s Day but then I got married. My husband is rarely home on Valentines Day. He is usually deployed or away training, it is always something. It is ok, we are used to it. I make they day special for my kids. I make heart shaped food, cupcakes and even more cupcakes for class parties and a special Valentine’s Day dessert with dinner. Simple and sweet is how we celebrate the day. This year I have decided to try a Gluten Free diet. Not to lose weight or any nonsense like that but to see if it would help with some autoimmune issues I have. I have done pretty good so far. Just a minor blip where I had to stop for a few days. The blip showed me that yes, my body does react to gluten. I could feel the difference when I had eaten gluten and I was determined to get back to my gluten free lifestyle. I do get cravings for all the sweet gluten filled treats like for cookies, cupcakes and brownies from time to time and I have been determined to figure out gluten free baking. I bought some King Arthur Multi Purpose Gluten Free Flour Blend a couple weeks ago and a craving for brownies seemed like the perfect time to try it out. I didn’t make just plain regular brownies though. 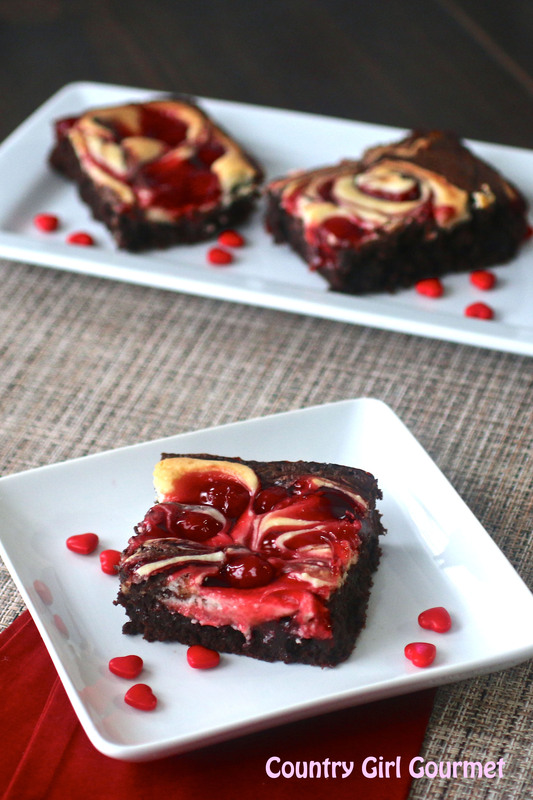 I kicked it up a notch and made Cherry Cheesecake Brownies. Oh my goodness is all I could say! They were delicious! I fed them to my family and they loved them and none knew they were gluten free. We tried them warm and later after being in the fridge a few hours. They were great both ways but especially cold. I think I have our Valentine’s Day Dessert! 1. Preheat oven to 350 degrees and grease 9×13 pan. 2. In a microwave safe bowl melt butter, once melted stir in sugar and then cocoa powder. Then mix in eggs and vanilla and then finally beat in remaining dry ingredients, flour, salt, xanthan gum and baking powder. 3. Pour and spread batter into prepared 9×13 baking pan. 4. In another bowl use an electric mixer or whisk, beat together the cream cheese, egg and sugar until smooth. 5. Dollop the cream cheese mixture on top of the brownie batter. 6. Dollop cherry pie filling (focusing on the cherries not the cherry gel) on top of cream cheese mixture. Note- some brands are more cherry gel than cherries, you want more of the cherries than cherry gel. Leftover cherry gel is ok.
7.Swirl together using a knife. 8. Bake for 35-45 minutes, until brownies are set and pulling from the sides of the pan. If checked with a toothpick it will come out with fudgy crumbs. 9.Cool thoroughly, then cut into bars and serve warm or cold. Store in the refrigerator. Are you making something special for Valentines Day? What are you making? Oh wow! 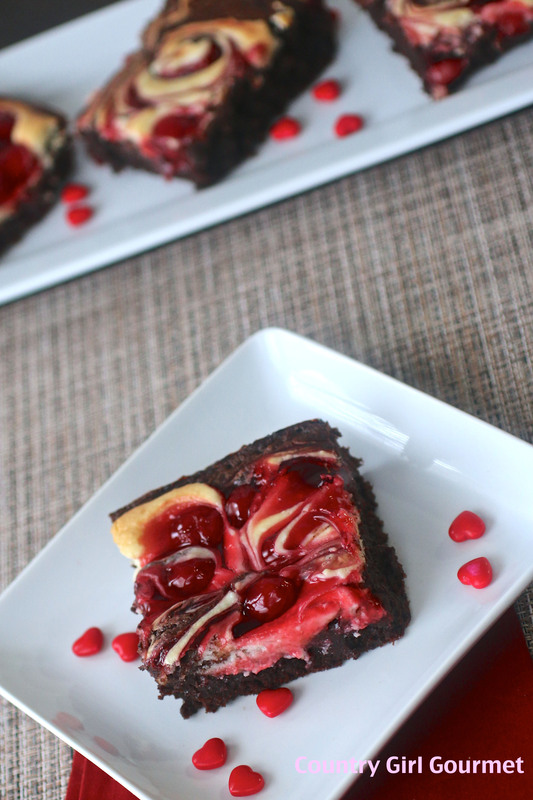 Cherries, chocolate and cheesecake are my favorite “C” foods! I’m so excited to have found another blogger who does gf, and I’m glad it is helping you. 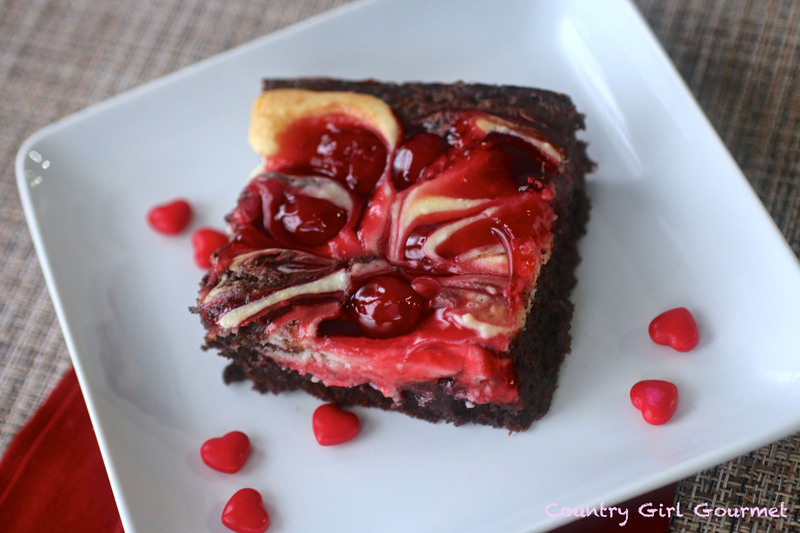 I have a soft spot for brownies and yours look delicious!